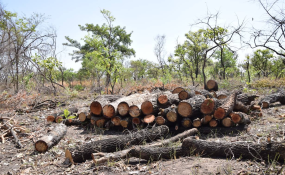 Logs felled by charcoal burners in Palaro, Gulu district, Uganda, February 13, 2019. Oyam — Government working with residents of Oyam District has endorsed a proposal to plant more than 240,000 trees in a bid to mitigate the effect of climate change. At least 30,000 trees will be planted in each of the eight sub-counties that make up Oyam District. They are Aleka, Minakulu, Myene, Kamdini, Otwal, Ngai, Iceme and Abok. So far, the government has made available Shs1.2 billion for tree planting and construction of community access roads in Oyam. The development comes at a time when heat waves compounded by strong winds have swept through Lango Sub-region, making life difficult for locals. Experts say the rise in temperatures and changes in the rainfall patterns is compounded by degradation of the environment, including deforestation and wetland encroachment. In Oyam, high population has put a lot of pressure on land and its vegetation. There were 388,011 people living in Oyam as of 2014, according to the national population and housing census of 2014. As a result, many people have now resorted to cutting down trees to burn charcoal and encroaching on wetland as a mechanism to earn a living. Leaders observe that the destruction caused by the locals to the surroundings has affected the agricultural production and productivity in Oyam. The chief administrative officer, Ms Dorothy Ajwang, said the district has received Sh1.2 billion from the office of the Prime Minister under phase three of the redevelopment plan - the Northern Uganda Social Action Fund (NUSAF3). At least 40 per cent of the money will be used in planting both fruit trees and wood trees, while 60 per cent will be used in roadworks, the district accounting officer, said. Tree seedlings will be procured and each sub-county will be given at least 30,000 seedlings to plant. "We had planned that each sub-county in Oyam gets at least 30,000 seedlings. These seedlings will be handed over to the various groups already formed under NUSAF," Ms Ajwang says. The locals have been encouraged to embrace the initiative. They are also being motivated to plant wood trees such as eucalyptus and pine. "When they grow, these trees will help locals in timber and they will maintain the environment in reducing unpredictable weather," Ms Ajwang says. Residents say they are pretty ready to engage in any activity that will help mitigate climate change. Mr Walter Okullu, a resident of Abok Sub-county, says he will plant more than 200 trees this year. "Oyam and Apac districts used to be the food basket for Lango but the pride is no more because of the changes in rainfall patterns brought about by a number of factors including the cutting down of trees," he said. "During those days, we would produce enough food both for commercial and subsistence - when the climate was still favourable but nowadays the production has been affected by the prolonged dry spelt," another resident, Mr Charles Odoc, said. The Oyam LC5 councillor representing Ngai Sub-county, Mr Walter Atoo, said the district council in 2018 agreed to start mass sensitisation of the community on the importance of tree planting. Such mass sensitisation often takes place during public gatherings such as churches, burial and wedding ceremonies. School-going children are also being encouraged to plant trees in their schools, Mr Atoo said. However, the LC3 chairman of Minakulu Sub-county, Mr John Ogwal, said the issue of mindset change has remained a stressing challenge.